There are two kinds of people I like to think I'm superior to even though I'm clearly not: Wikipedia writers and male gymnasts. With the former group it's because they're doing for free what I do for money, and with the latter it's because they wear tights. But then I read Wikipedia and see how good it is and realize those people are way smarter than I am. 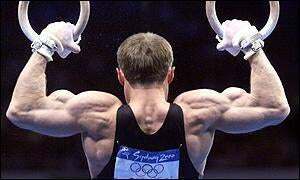 And then I look at male gymnasts and realize they could pound me into oblivion. Anyway, I was thinking about that as I stumbled across the Wikipedia page for the 2020 Summer Olympics. It seems kind of ridiculous that someone sat down to write an article about a sporting event that is still more than a decade in the future. And it seems even more ridiculous that hundreds of people took the time to edit that article. But you know what? It's pretty cool. For instance, I had no idea that Minneapolis and Philadelphia are considering bids, as are Cape Town, Prague and Copenhagen. Although on the discussion page someone expressed extreme skepticism that Auckland was listed as a potential bid city. I'm not sure why there are no Wikipedia pages for Olympic Games even further into the future, but I have a feeling that will change soon enough — 2040, anyone?